At some point in the life of almost any successful business, the time comes to address the issue of potential growth or expansion. Successful aerial adventure parks are no exception. Consider the scenario where a park operator determines that visitation is healthy, the revenue stream is steady, and profit margins are ample, but then wonders: is the status quo enough? Is there a chance to take a step into a bigger, better world of financial performance? There are fundamentally two ways to expand: by adding new activities to an existing park, or by opening a new park (or parks) elsewhere. The decision shouldn’t be taken lightly. While opportunities for increased revenue might beckon, there is also a risk of seeing revenues get sucked into a black hole of increased operating costs and other pitfalls. Here, we explore two examples of operators who took different approaches to expansion. 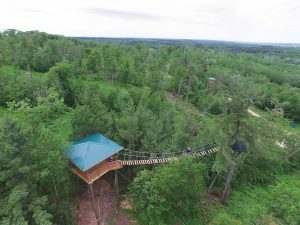 Lee Kerfoot’s MN Zip Line Adventures expanded to a second location. Lee Kerfoot, owner of two parks in Minnesota, opened his first park, eponymously named Kerfoot, in 2013. 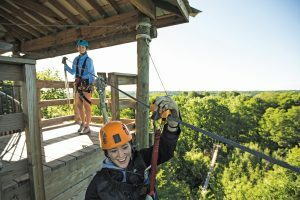 The 14-zip-line canopy tour billed itself as “Minnesota’s top rated zip line adventure.” Less than an hour’s drive from Minneapolis, the park attracted, for the most part, day visitors from the greater metropolitan area. With business being brisk, attracting about 10,000 visitors a year, Kerfoot looked for an opportunity to up the ante by opening a second park, seeking something “neat but different” from the Kerfoot park. Location, he decided, was everything. “We wanted to find a unique piece of land,” Kerfoot says. “If we couldn’t find it, forget it.” What they found was a scenic location in the rural Brainerd Lakes region, about 2.5 hours northwest of Minneapolis. There, in 2016, Kerfoot opened a second canopy tour, with seven zip lines, a suspension bridge, and a 50-foot free fall. Kerfoot decided to open a park in the new location for a couple of reasons, other than simply to increase his revenue stream. For one, he expected Brainerd, given its rural location, to attract more of a tourist clientele, supplementing the more urban clientele at the park closer to Minneapolis. Second, he believed the two parks could, as he says, “promote each other. If you liked it here, why not try our other location?” Finally, with “the industry expanding, if we didn’t do it, someone else would,” he says. In other words, he wanted to beat the competition to the marketplace. Of course, a starting point for any expansion decision is financial viability. It would make no sense if red ink swamped any potential new revenue. Kerfoot managed to keep his debt exposure in check by leasing the land in Brainerd, avoiding potentially cumbersome land-purchase costs. In addition, most of the necessary capital was raised privately—friends, family, and private investors. Bank loans were essentially out of the picture. One aspect of the expansion that he admits undervaluing was the difference in sales and marketing for a tourist audience as opposed to an urban audience. “I wish I had done more advance work on the marketing,” Kerfoot says. Only after opening did he work to forge relationships with the biggest resorts and hotels in the area, as well as the local convention and visitors bureaus. That was not a marketing strategy he had employed aggressively in the more urban Kerfoot park, but it’s a key means of driving business in a tourist area. Management was another challenge he encountered in opening a second location. Simply put, he couldn’t be in two places at once, especially two places roughly three hours apart. While he says he’s now satisfied with the management at both parks, an inability to be on site at all times inevitably breeds anxiety. By expanding on-site, ZipZone can host groups and get more repeat visitors. Separation anxiety was not a problem Lori Pingle, co-owner of ZipZone in Ohio, encountered when she determined that the time for expansion had come. Rather than open a new location, Pingle chose to add new activities at an existing location. Rather than go after a completely new market of potential visitors, she sought to reach a broader audience within the market ZipZone had already tapped. Pingle did one other thing that Kerfoot didn’t—before expanding, she hired a consulting firm to generate a feasibility study. That firm was Strategic Adventures, and its first step was to do a market analysis that started with the most basic of calculations: was expansion financially feasible? Pingle concedes that “we already had a business that was doing really well, so it was kind of scary to change things.” But as a zip-line-only park, ZipZone had a couple of shortcomings: it was hard to accommodate large groups, and it was hard to attract return visitors. 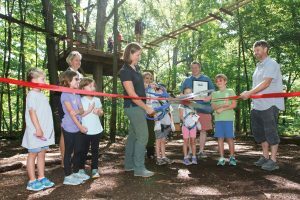 What was needed was an adventure park, something Pingle calls “more active and more physical” than simply clipping onto a zip line, and something that, with five different routes, would more likely be of interest to return visitors. It could also host more visitors, especially larger groups, at the same time. When expanding from urban to rural, the target audience is different. Paul Cummings of Strategic Adventures says that Kerfoot, in shortchanging his initial marketing efforts when expanding to the Brainerd location, made a common mistake. “Marketing is often a piece that is overlooked,” he says. A simple “field of dreams” approach—build it and they will come—is wishful at best. Cummings suggests a pre-opening marketing budget of five to 10 percent of anticipated revenues, rising to 7.5 to 12.5 percent post-opening. Second is making sure the choice of new activity and/or location fits an overall business plan. As Cummings puts it, “It needs to be different enough so that it’s not more of the same.” Kerfoot accomplished that goal by moving to an entirely different location and heeding his own advice, that any new location has to be a “unique” piece of land. Pingle accomplished this by adding an activity that complemented ZipZone’s existing offerings. Cummings concedes that in some parts of the country, zip lines are “getting saturated.” Not only is there an abundance of zip lines out there, but, as Kerfoot says, “Less zip line repeat business is the reason for an adventure park.” That’s an approach Pingle certainly took. Cummings, however, issues a cautionary note: Be sure that any new activity doesn’t “cannibalize” existing activities’ business. While Cummings says that there are certain economies of scale in any expansion, new hiring is clearly essential. That might not be easy in the current labor climate. “It’s hard to find qualified management staff” for adventure parks, Cummings says, although he believes that in a growing industry, the pool of potential candidates for park management jobs will gradually grow as well. Finally, Cummings counsels, give it time. 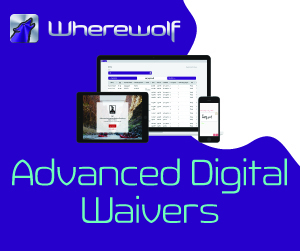 He suggests a five-year timeframe as a rule of thumb in determining the success of an expansion, though the wisdom or folly of the move may become evident sooner than that. Still, no one should expect overnight success. Within that context, both Kerfoot’s and Pingle’s expansions are still in their infancy. And both have been successful so far, in their different ways, even if there were pitfalls to sidestep along the way.